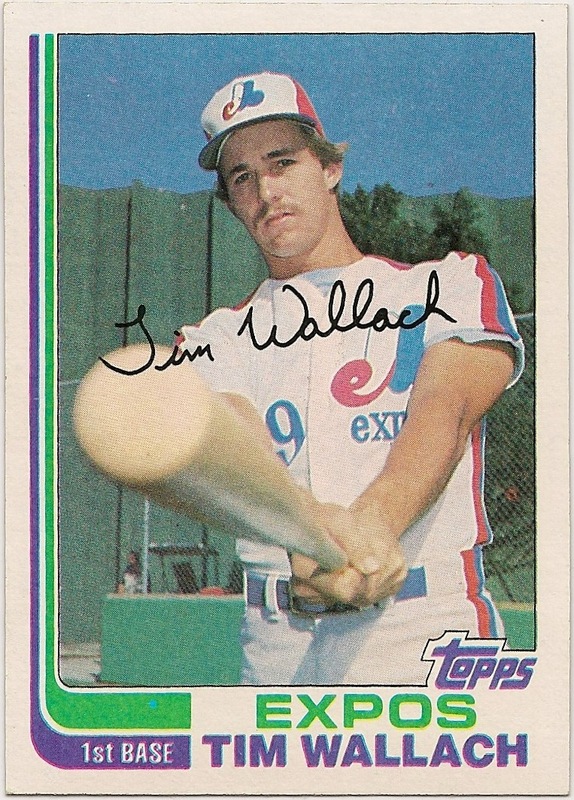 Card Review: 9.9 This is Tim Wallach's marquee rookie card. At one time this card booked at over $4. My first trip ever to a card shop was made with the purpose of finding this card. It was probably about 1985 or '86, and my father took me. I had no idea there was such a thing a stores devoted entirely to baseball cards. My father had bought cards as a kid, a good number had survived in a shoe box, but he was in no way what you would describe as a card collector. His collection ceased in 1968, and he didn't see a card again until people started giving them to me. He was much more inclined to throw b.p. at a field or play catch in the yard than buy cards, and by the time my brother and I were 12 or so he flat out discouraged it as kid stuff. 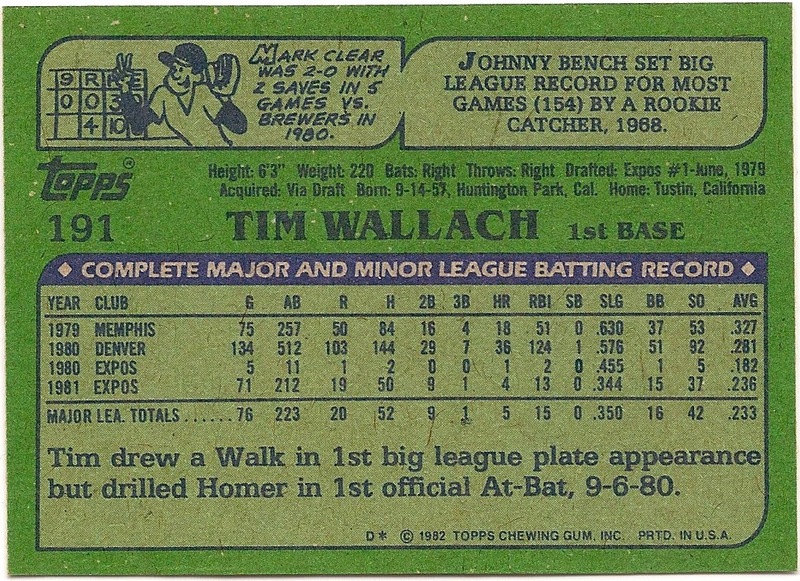 But somehow back before then, he got the idea in his head that I should have a Tim Wallach rookie card, and found a cardshop in the yellow pages (The Batter's Box near Thunderbird High School in Phoenix). 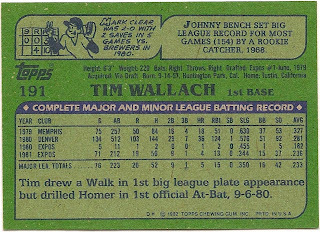 I remember arguing with the cardshop guy because I thought there should be a 1980 Wallach since he had stats for '80 on the back of his cards. But the guy had a book and proved me wrong. 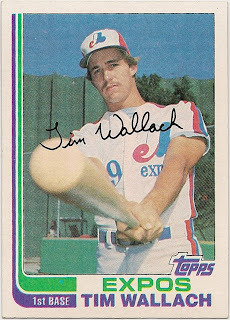 Fun Facts: *Topps missed out by putting Wallach on the '81 Expos Future Stars card. Had Wallach shared a card with Raines, it really would have been one of the great cards of the 1980's. *Wallach wore #58 and was an outfielder when he was called up in 1980 for his MLB debut. He homered in his first official at-bat. *The 1982 All-Star game was in Montreal. Wallach was a huge snub, his triple crown numbers in '82 were .268, 28 HR, 97 RBI. Ray Knight was named an All-Star at 3B instead, with numbers of .294, 6 HR, 70 RBI. Topps may have screwed up Wallach for not having him in their 1980 or 1981 sets, but they made up for it with that amazing photo. Great card.